I woke up today craving pizza. But it was unfortunately time for breakfast. I know what you’re thinking – when has that stopped you?! And I agree. When the craving for pizza strikes, you must give in. By the way, Denver’s not in town this week but I know he would’ve approved of my little experiment. My little experiment being combining my love for pizza and breakfast to make the best pizza bread ever. 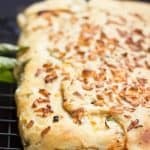 This bread is really easy to put together, and took me a little over an hour from start to finish. 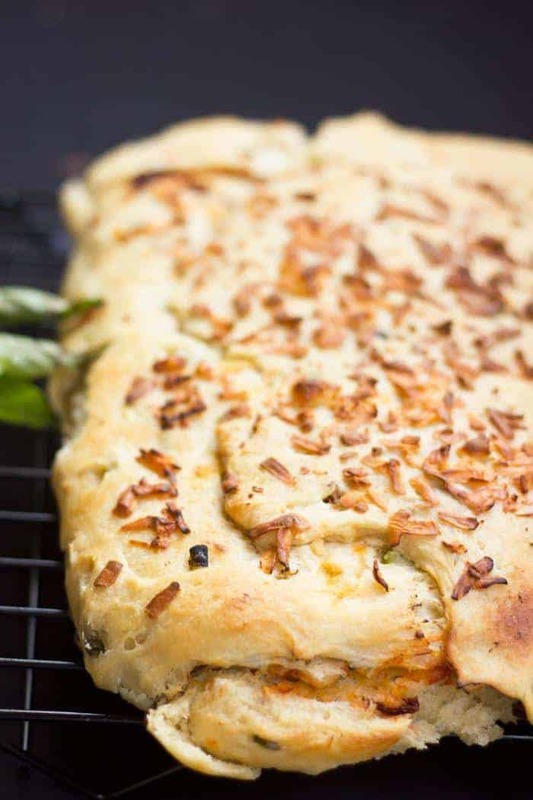 You combine all the ingredients for the dough – no kneading required and then let it rest for about 40 minutes till it doubles in size. Once that’s done, just transfer it on a baking sheet lined with greased parchment paper and stretch it out lightly with your fingers. 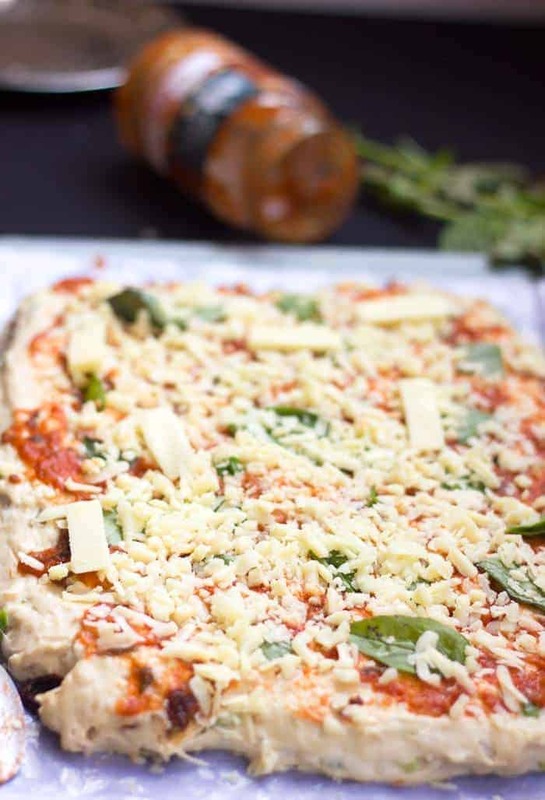 Spread your favourite pizza sauce on the dough and sprinkle with basil leaves. Grate your favourite cheese. As much as you want. Nobody’s judging you. We all know cheese makes the world a better place. Roll up the dough letter style. Mentally divide the dough in three parts and then flip the first part to the middle, and then the third part on top. Pinch the ends together to stop that awesome sauce and cheese from oozing out. No that wasn’t a typo. I kinda love that word. AWESOMESAUCE. AWESOME. SAUCE. Pre-heat your oven and bake. And then finish most of it while standing on the kitchen counter, waiting for it to cool down. Or not. If you try this out, show me a picture on Instagram by tagging your photos #myfoodstory. 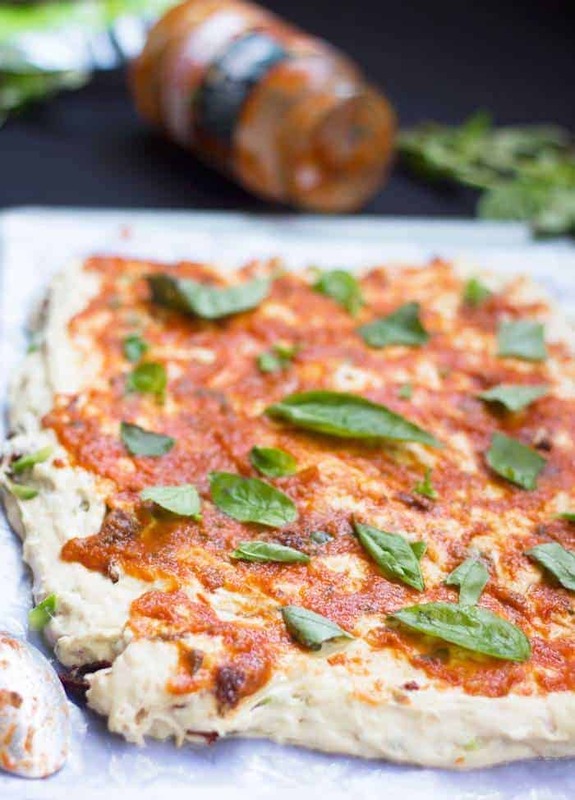 The best pizza bread ever oozing with marinara sauce and cheese to keep your satisfied when the craving for pizza strikes. Dissolve the yeast and sugar in water and keep aside for a few minutes till froth starts to develop on the surface. In a large bowl, combine both the flours, salt and vegetables by hand till mixed.I used onions, capsicum, sun-dried tomatoes and olives.Add the yeast and water mixture and olive oil. Combine with a spoon, spatula or just use your hands like I did. The dough should be moist and slightly sticky. Add extra water by the teaspoon if required. While this does not require kneading like most breads, its good to mix for 3-4 minutes till all the ingredients are properly combined. I just transfer the dough to the counter and knead lightly for a couple of minutes. 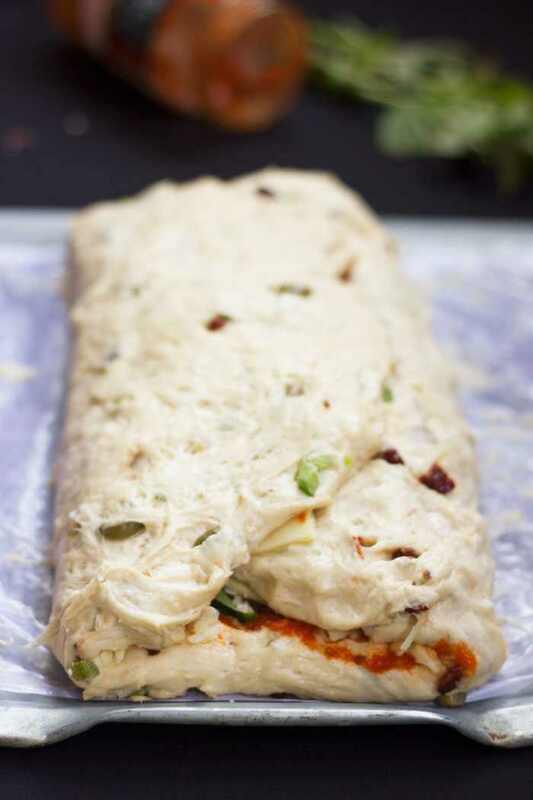 Cover the dough with a cloth or cling film, and set aside in a warm, dark spot till it doubles in size. I usually place the dough inside my oven without switching it on. Once the dough has doubled in size (it took mine about 40 minutes), transfer the dough to a baking sheet lined with greased parchment paper. Be careful not to deflate it completely. 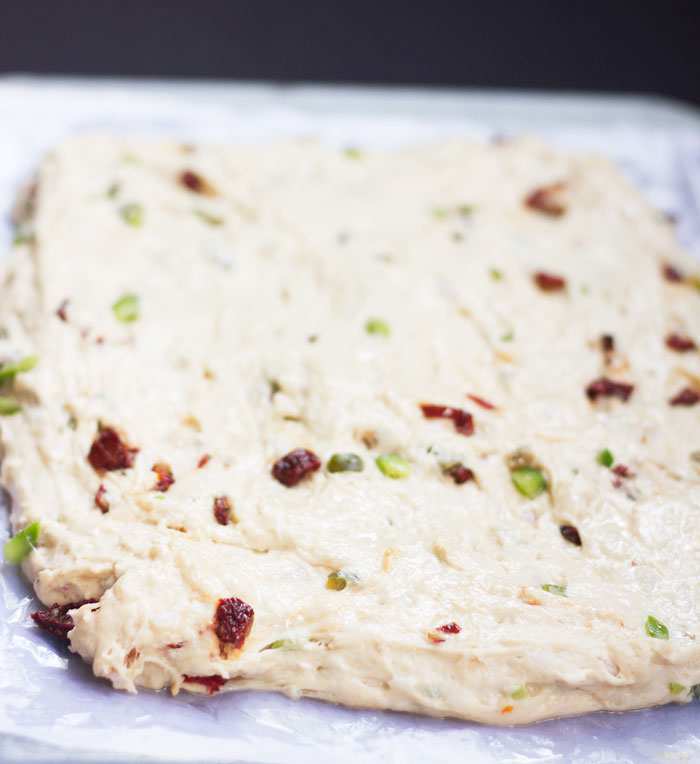 Lightly stretch the dough till it forms a rectangle. Spread a layer of marinara sauce, sprinkle with basil leaves and grated cheese. Now mentally divide the dough into three parts. Flip the first part on the middle and then flip the third part on top of it, letter style. Seal the edges and brush all over with olive oil. Pre – heat your oven to 220 degree Celsius and bake for 35-40 minutes till golden brown. Helloo there, what vegetables dis you use? And also, I love your blog. Going to try the eggless brownies soon. Woohooo I love it too! Hey, just tried this recipe! Loved it! Awesome.. And so simple! Thank you so much!